The Low Down: Dusty Everhart is a literal nightmare. She’s only known for two months that she must feed on people’s dreams to exist. She has no control over who she feeds off of or when; that’s decided by The Will. It’s an awkward process, too, perching on the dreamer’s chest, fingers to the head, being swept into the dream. Slipping through someone’s upstairs window one night, she rolls the subject over, only to discover she’s in the house of the hottest guy at Chickery High School. And he’s only wearing boxers. Once she’s in Eli’s dream, though, she doesn’t understand why he is dreaming about a place that he couldn’t know about; it’s her school, Arkwell Academy, and it is only a place for magickind. Then weirder, still: there are police investigating a murder. Of someone Dusty knows. But the strangest thing happens when Eli sees Dusty, and her magic does not work on him. He wakes up and demands to know what’s going on. But she is so out of there. Apparently it doesn’t happen often when two people can work together in dreams, so now Dusty’s a dreamseer. That’s a valuable commodity that the Magi Senate is keen to use, but Dusty is not being told the whole story. And when there’s a second murder on campus, Dusty, Eli and their friends know they can’t just sit around and do nothing. But what if the murderer is someone closer to you than you thought? Soooooo…: I absolutely loved the idea of the “animated” everyday objects and electronics. The fact that some things might go a little haywire being around all that magic was a great idea. However…: The book started off with a bang, but the pacing slowed down almost immediately. It was very disappointing, because the idea that there is a magic creature who lives off of dreams is super cool. Being able to rewind or watch a dream or poke around inside someone’s head while being able to fly or change your appearance would be well worth the price of admission. Sadly, it was downhill from there. The dialogue was occasionally clunky and sometimes sounded like a tween’s diary entry. It also had one of my peeves: the insta-emotion. That’s my term when, for example, two people are having a conversation and the emotion ratchets up so quickly that it’s not very believable. It’s more like melodrama. There were also plot devices that were flimsy, like Eli transferring to her school even though he’s not magical. It wasn’t explained in any way that seemed realistic. Telling vs. showing. Don’t tell me that he has long hair or she likes to ride her bike or your mom bakes apple pies. SHOW me in the dialogue or action. It takes many more words to convey something that way, but do you know how much more vivid the writing is? How much more memorable the characters are? How much better the story is? David pushed his thick, black hair out of his eyes as he surveyed the crowd. This was the first time he had ever played Lucy in front of a crowd. Well, in front of anyone, actually. As he tuned her and adjusted the strap, his hazel eyes roamed the audience nervously. Was she going to be there? David has black hair and hazel eyes. He plays the guitar in a band. He has a crush. This was lacking from the story for me. The showing. The Bottom Line: I have to be honest: if I hadn’t liked the subject matter, I would have given this less than a three. 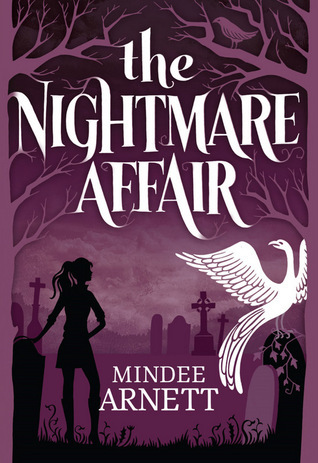 The Nightmare Affair by Mindee Arnett was published today by Tor Teen. A free copy of this book was given to Ink and Page in return for an honest review. Big thanks to NetGalley, the Publisher and the Author. Aww, that’s too bad this was a bit of a disappointment. I also like showing more than telling. Well, doesn’t everyone? I actually get really sick with all the mean girls in YA. I mean, please! And where are the mena boys? There’s never any mean boys.